From the wilds of Scotland to the suburbs of Surrey, we’ve got twenty-one of the UK’s best mountain bike trails for you to ride, plus GPS downloads. If you want to see the full list of all our free-to-download GPS route files head over to our Mountain Bike Routes page. This ride is all about reaching the infamous Nan Bield Pass and experiencing the Kentmere Common descent that follows it. Sunken alpine hairpins, fast stony singletrack, sketchy, mucky gambles, sudden techy chutes, chilling streams, nightmare ruts and some all-out randomness… all set amid an awesome Lakeland valley landscape. To see the map and download the GPS route, click here. Pack your head for heights on Rhyd Ddu! This mountain circuit will take you to the top of Wales’ highest peak — and back down along a route you’ll never forget. It starts with a steep climb (don’t feel too bad if you need to get off and push — we did) to Bwlch Maesgwm, where you’ll enjoy smooth-rolling singletrack all the way down to the lakeside town of Llanberis. From the outset, this splendidly isolated trail ascends consistently and gradually — rarely does such great altitude come so easily. Only in a few places will you need to switch your brain on, and this firm, stony trail is rideable in all conditions, offering considerable grip. Once up on Bealach Ban, you are greeted by one of the best views anywhere in the UK. To the north is the Liathach, a collection of Munros arranged along a West-East axis, and it’s here that the terrain of Torridon is at its most striking. Cut Gate trail in the Peak District: this is the definitive way to do it. Cut Gate typically poses a real conundrum to a lot of mountain bikers. It’s hard to decide how to fit it into a loop, so it often gets left out and riders head over to the other Peak classics like Jacob’s Ladder or The Beast, both of which are much easier to work into a loop. The lower sections of Lairig Ghru won’t deliver the heights or distances of the other mountainous regions of the UK but fear not — what this trail can give you is an undiluted mountain bike experience that can be sampled as many times as your body can take it. Looking at the stats (13km / 8 miles), this route may appear a bit paltry. But this is the Lake District, and eight miles along Lakeland trails can be a real workout. This route takes in arguably the Lake District’s finest lake before sending you off round the back of tourist-free nowhere. Then it’s a return to Ullswater via an arduous up, then an adrenaline-tastic down, from the head of the Boredale Valley. At the base of Stob Bàn, you can’t help but feel inspired. Here in the Highlands the tallest peaks in the UK meet the sea within four and a half miles, and once you hit the trails, the old adage that ‘time flies when you’re having fun’ couldn’t be more true. This patch of Scotland is somewhere you can lose yourself in beautiful terrain, and it’s only in a rare moment of clarity that you’ll notice your perspiration as you march upwards. This route ticks off almost all of the classics. 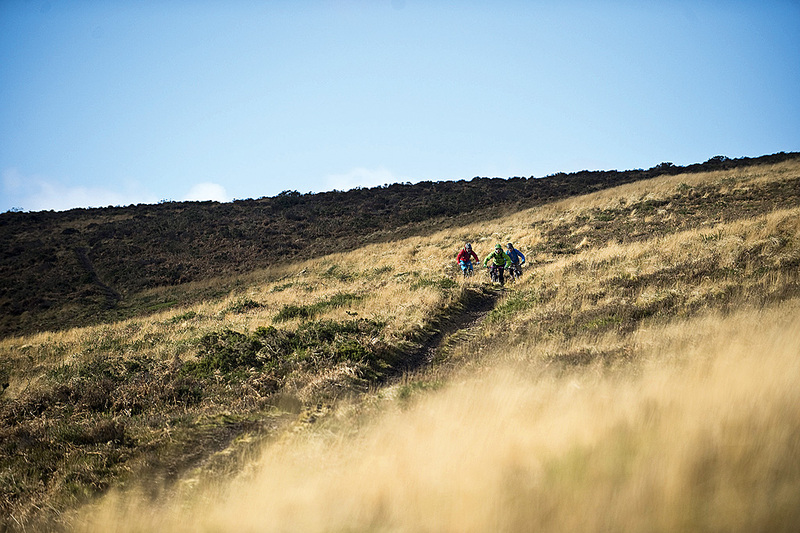 Alongside the plentiful flowing, natural singletrack, we’ve given you the option to test yourself on some seriously technical descents. Triscombe, at the southern end of the Quantocks, boasts a multitude of challenging downhill runs accessed by a steady fire-road climb. The ride starts in Porlock, giving you a chance to stock up on calories — you’ll need them! After a steep climb, the first great singletrack drops through Horner Wood. A couple more punchy climbs lead you to Webber’s Post and a long, rocky singletrack across open moorland to Brockwell. There’s something dramatic about starting out from one of the largest lakes in the Lake District, looking upwards at mountains thrusting their way into the sky abruptly from the deep water. Helvellyn is the third highest peak in the Lakes, but it’s the most rewarding to ride, and this route combines ascending the mountain with a glorious descent down Sticks Pass. The narrow window of opportunity imposed by cycling restrictions means most riders tackle it in the winter. Which brings a high probability of bad weather. With this in mind, it’s important to treat the mountain with the respect it deserves; plan for the worst and make sure someone knows where you are. An OS map of Gunnerside Gill and its surrounds shows gentle climbs interspersed with unrivalled severity. Over the flat tops of the moors, it’s almost impossible to find contour lines that come together. Industrial and glacial activity have left their mark on the perimeters, however. A climb up to, or a drop off, the moors will involve a journey across the thickest of contours. This classic ride in the Howgill Fells is a loop which can rival the best the Lakes has to offer — but without the traffic that can blight the best Lakeland trails. It takes you up into the mountains of Cumbria to experience a natural and otherwise fairly inaccessible piece of singletrack beside Bowderdale Beck, before returning you back to the start. There are several ingredients that combine to make the Surrey Hills such a mecca for mountain bikers in the South-East; the sandy, loamy soil, the work of the trail pixies and the generosity of the philanthropic Bray family, custodians of the Hurtwood Estate. It is their open-access policy that allows mountain bikers to enjoy the singletrack on offer, so be sure to act responsibly. It’s a relentless climb up to the top of the Doethie Valley, round the side of the Llyn Brianne Reservoir and up the byway at Soar y Mynydd, but it gets the climbing done with some epic views for visual relief. The descent’s just as relentless too — a full-on phantasmagoria of singletrack that hugs the side of the valley, delivering roots, rocks and off-camber fun. The highlight: an amazing section of rocky slabs to roll and jump as you please. The Long Mynd rises out of the ground like the back of a whale breaking the surface of the ocean. It’s a vast, friendly looking lump of a hill with one of mbr’s favourite trails — long, fast and fun. Just watch out on a windy day, as the lack of tree cover means it gets pretty breezy. Skye is one of the best places to ride in the UK, so get up to Scotland and sample our route from the July 2013 issue. On then, to Westerdale, home to Great Hograh; a prime stretch of moorland singletrack if ever there was one. The rest of Great Hograh Moor delights, and with the loop measuring only a short but sweet six miles, by midday we were pulling up outside the Castleton tea rooms for lunch. Flowing singletrack has never been a calling card of the Lake District, which is perhaps why this little loop has become such a firm favourite with locals and visitors alike. It’s a ride of two halves, with the majority of the climbing — certainly the bits that require pushing — in the opening stages. And then, after a short section of tricky navigation, the singletrack eases in. Ridden any of our top tips? Got any routes you think should be included in our list? Let us know in the comments below or on our Facebook page.